A non-Serenity related spaceship called a Firefli. 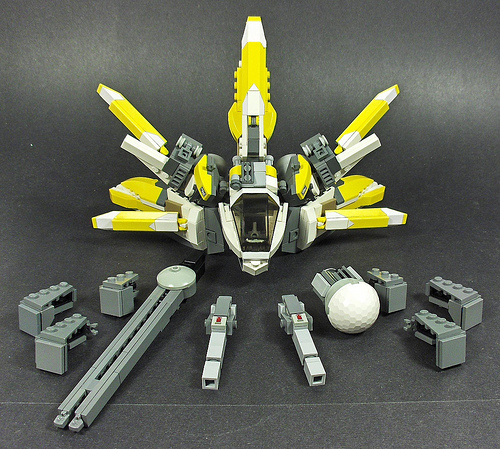 Tekka Croe has built a beautiful new space fighter. He’s called it the “MX-01 Firefli”, and while I’m not sure why it’s not a “Firefly,” I really enjoy the shape of it. It looks more like a tropical fish than anything else to me, considering all the bright colors and spines. It’s also quite heavily armed, as you can see. Wow, lovely. Great use of colors and pieces. And those accessories are great. This has such a cool shape and colors. Epic! This starfighter contest is looking really good so far. I wish I hadn’t entered so early, because I’ve built a few more starfighters since that might be even better than my entry.